The Iron Age settlement of Epetion is situated in the area of present-day Stobreč, a few kilometres from Split, on the eastern coast of the Adriatic Sea. Historical sources relate that in the Hellenistic period Epetion was allied with the island town of Issa, founded as a Greek colony on the island of Vis, and that their connection was a consequence of the spread of the Issaean political and economic territory to the Central Dalmatian coast. The advantages of Epetion included the proximity of fertile fields, a suitable geographic position with natural communications with the interior, and a deep, protected bay as an indispensable precondition for maritime trade. It is assumed that Epetion played an active role in the transfer of Issaean economic products, but also of the attainments of Greek civilization further inland. Therefore, by studying this site we may gain insight into certain aspects of Central Dalmatian maritime trade during the Hellenistic period, but also into the two-way processes of acculturation between the newly-arrived Greeks and the local populations in Central Dalmatia. The Hellenistic settlement occupied a small peninsula covering around 4.5 hectares, visually dominating the large bay. The peninsula and the bay are a protected cultural property. This site has never been part of a systematic archaeological investigation and the topography of the settlement itself is poorly known. Unfortunately, a major part of the settlement has been destroyed by modern buildings. Towards the end of the 1960s and at the beginning of the 1970s the Institute of Archaeology carried out small-scale investigations at the Hellenistic rampart. 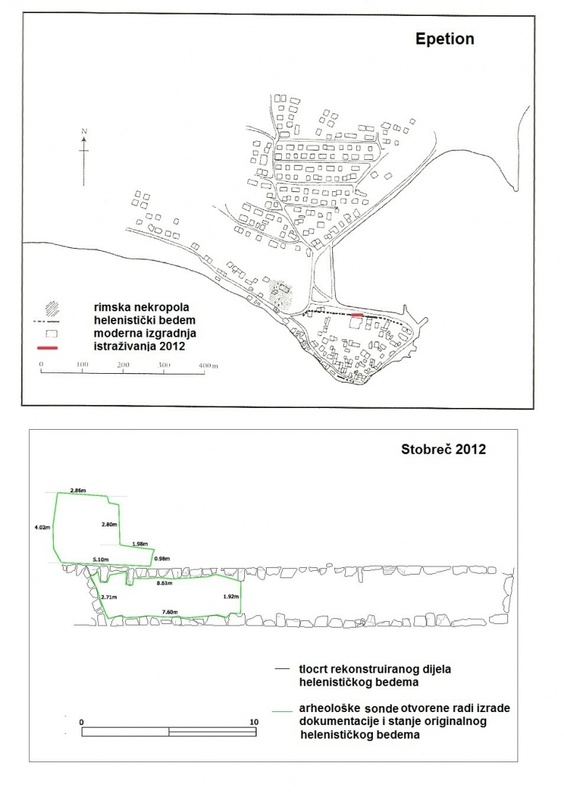 In 2012, the Institute of Archaeology, in collaboration with the Institut für Archäologie and the Institut für Geographie und Raumforschung from Graz (Austria) carried out small-scale geophysical surveys in the immediate surroundings of the Hellenistic rampart on the northern side of the peninsula (outside of and inside the town perimeter), after which archaeological excavations were undertaken with the aim of determining the situation and creating the documentation for the mentioned part of the Hellenistic rampart. The Hellenistic Epetion was surrounded by a two-façade dry-stone rampart built of large stone blocks, with a width that varies between 3.2 and 3.4 m. The prepared documentation confirmed that the reconstructed portion of the northern section of the rampart, visible today above the level of the terrain, continues in deeper layers with an original section, whose exterior curtain was documented to the depth of 2 m. The Stobreč rampart is the best-preserved vestige of the material culture from the Hellenistic period at this site.